Musical intelligence—together with the intellect that does not always go with the former—is not something that can be acquired by becoming a musician. It is gifted to the musician who might then hone this gift with practice and by surrounding him or her with the right kind of mentors and collaborators to produce something—a work of musical art—that might be admired and respected. In the case of several musicians similarly gifted and schooled, and practiced, the pleasure that comes from experiencing that work of art is magnified. In the even that this happens to a listening audience, so powerful might the impact be on the mind’s ear that it would seem that the musical subtext is dictated from a spectral dimension. 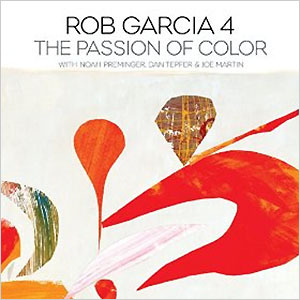 This seems to be the case with The Passion of Color by the collectively sublimely gifted quartet—the Rob Garcia 4. The fact that the group is named after the drummer only suggests that he might have put it together, but make no mistake, this a wholly collaborative effort. The full force of the dry yet wholesome tone of Noah Preminger’s tenor saxophone does not dominate any more than Dan Tepfer’s spare but passionate playing of the piano or Joe Martin’s rumbling bass. However, the glue that holds these artists together might be the incessant tic-a-tic and the swish of time-honored ride and high-hat cymbals of drummer Rob Garcia, but that is all. In the coming together of like-minded musicians, much more than notation on lead sheets is shared. If the music on this disc is any indication, it is a passion for reaching deep into the soul of a music that appears to be animated by the emotional playing of each musician. Mr. Preminger rolls his fingers over the keys of his saxophone and with great gusts of air he produces sometimes short and sometimes long retinues of notes. The saxophonist releases these into a rarefied realm of the listening room to pirouette like a group of dancers on an elevated stage. Dan Tepfer is an incredible pianist. He can be wry and even ironic when he plays in short bursts. But when his music is in full flow, the music heats up and runs become more frenetic and in such hyperactivity, the arpeggios become more exquisite to hear and the overall harmonics a delight to listen to as well. Joe Martin sallies forth with plump and rounded notes that seem to be plucked right out of the air around the room. His arms wrap around the bass violin as he pumps out rumbling lines that angle themselves at the melody; this with melodic invention as well. And Rob Garcia’s drumming is like that of a percussion colourist daubing the melodies and shading them as if he were laying out colour on blank canvas. This is indeed the call to the rest of the musicians to also play their instruments as if they were wielding paint brushes as if they were possessed by someone like Robert Rauschenberg or Jackson Pollock. The whole album centres round what might be considered the result of this abstract expressionism. Thus a marvelous energy ensues and the resultant musical brushstrokes on “Lines in Impression” turn inside out to transform the concreteness of tone and shading into abstract expressions on an aural canvas. The same intensity prevails through “The Passion of Color” and “Purple Brush,” but this is only part of the story here. There is other music that is impressionistic such as the meditation on the evolution of life in the chart, “The Caterpillar v/s The Butterfly”. And in “The Painter” there is not only a waltz that recalls the magnificent drumming of the legendary Max Roach who first played a series of waltzes on his drumset, entitled “The Drum Also Waltzes”. And finally there is that new standard in the plaintive voicings of Jimi Hendrix’s “Little Wing,” which concludes this masterly crafted album. Track List: The Still Standing Blues; The Passion of Color; The Caterpillar v/s The Butterfly; It’s Time; Lines in Impressions; Purple Brush; The Garden’s Poet; The Painter; Little Wing. 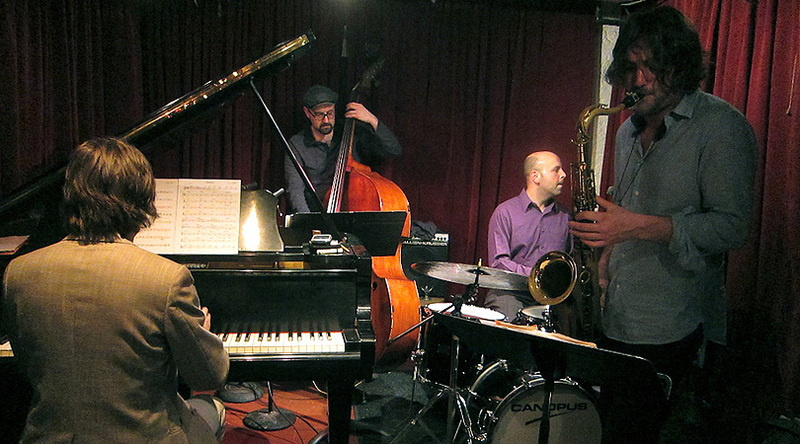 Personnel: Noah Preminger: tenor saxophone; Dan Tepfer: piano; Joe Martin: bass; Rob Garcia: drums.